Add Paldesk Live Chat to Squarespace in minutes and customize it to match your theme. Gain insight on how to set up live chat on your Joomla website. Set up live chat on Prestahop, one of the most popular and widely used eCommerce platforms. Find out how to set up live chat on your Drupal website and provide great customer service. Learn how to set up a live chat on your Wordpress website in less than 4 minutes. Read up on how you can send widget setup instructions to your webmaster. Simple & Quick. No coding required. Copy-paste a code snippet onto your website and start chatting with visitors. Bring your customer service to the next level with just a few clicks. Get set up and running! Your Magento 2.x extension can be installed in few minutes simply by editing the Magneto Configuration. 1.Download/purchase the extension (like .zip or tar.gz archive) from Magento marketplace. 2. Login to your Magento 2.x Hosting site (for details contact your hosting provider). 3. Open some kind File Manager for listing Hosting files and directories and locate the Magento root directory where Magento 2.x is installed (also can be FTP or File manager in CPanel for example). 4. Upload Extension (as .zip or tar.gz) to your Magento 2.x installation root directory. 5. Unzip the file in a writable temporary directory. 7. Now return to following path app/etc/ and open config.php file for editing [app/etc/config.php]. 9. Save and close the file (be careful not to do any other changes). 10. Now go and open the Magento 2.x Admin panel. 11. In the Magneto Admin panel disable the cache under System­>>Cache Management (in Magento Admin menu). 14. To fill API KEY, you have to have Paldesk Live Chat account already. If you don’t have one, click here and please create it. 15. To fill API key field, go to Paldesk app. Next, choose ‘Administration‘ from the left-side menu. Under ‘Embeddable elements‘ select ‘Website Widget‘. Click on ‘Install‘ and copy the API key at the bottom of the page. 16. 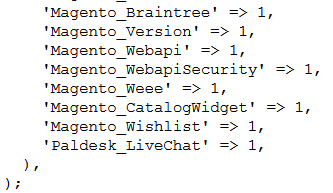 Go back to Magento Admin panel, paste the API’s key code and press ‘Save Config’. Remember, if you encounter any problem, contact us or chat with us live.